I love cats! And this litlle one is wonderfull! looooooool, how do you tame such lion.Awsome. Me and my girl thinks she is lovely and adorable!!! so adorable! i love it! she's the cutest EVER! She's sooooo cute!! !OMG SOO ADORABLE!!! That kitty is so adorable! You captured its pose and expression really well! gah, I swear the cuteness makes me so happy! it looks like he wants to know something... I wonder what. Featured hope u don't mind. that's really a wild lion! OMG!!!! It's SO cute!!!!! I love it!!!! looks like my cat when she was little. but now my cats just a satin cat. and im guessing this one is sweet and playful. thanks thanks! Yes, she actually is sweet and playful still, being 4-5 years old. When she gets time inbetween all the sleep.. lol!! ya! 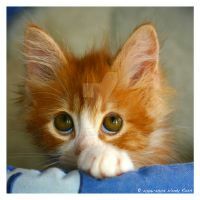 i luv kittens! Feel free to send e-cuddles! I will deliver them personaly! haha so cute! great shot! That is a very adorable kitten.